The European Central Bank will publish the accounts of its June 13-14 monetary policy meeting on Thursday at 11:30 GMT, when details of the discussion to end the Bank’s massive asset purchase program (APP) will be revealed. While a decision on winding down the bond-buying program was not anticipated by many to come as early as the June meeting, the bigger surprise came from the ECB’s rate path forecast, with the first rate hike pushed out until after the summer of 2019. The euro has been subdued since the dovish tapering decision and traders on the lookout for some hawkish inclination are likely to be disappointed from the minutes. 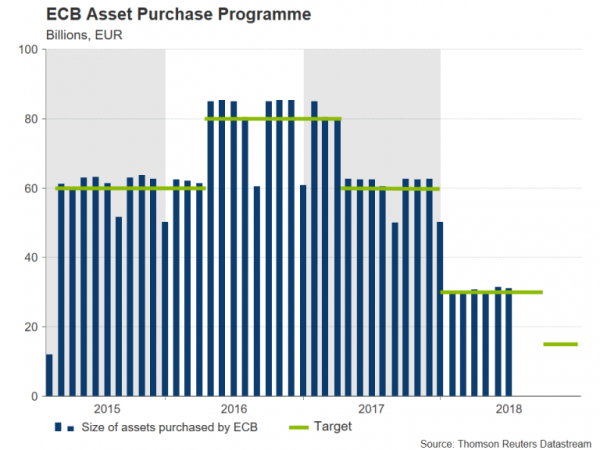 With the Eurozone economic recovery becoming broad based and progress on lifting inflation, the ECB announced the long-awaited termination of its APP program in June, putting the brakes on four years of quantitative easing. 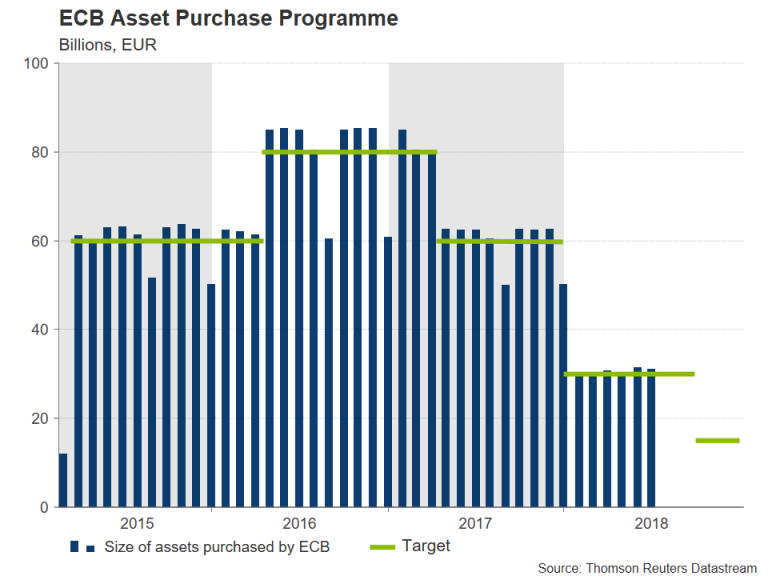 The extension of the QE program beyond 2018 had been doubtful for some time as growth in the euro area finally gained momentum in 2017 and the ECB successfully fought off the threat of a deflationary spiral. Expectations that the ECB would soon join the central bank bandwagon of hiking rates pushed the euro to a more than three-year high of $1.2555 in February, with bullish traders betting on a rate increase as soon as March 2019. The consensus though was always the middle of 2019 and is why the explicit forward guidance provided in the June meeting that interest rates will remain at present levels through the summer of 2019 was far more dovish than what the markets had been anticipating. Adding to the dovish undertone was the attachment of the condition that the stimulus withdrawal is dependent on growth bouncing back after a slowdown in the first quarter of 2018. Although more recent data out of the Eurozone suggests that growth is accelerating again, and headline inflation reached 2% in June, the ECB insists the bloc’s economy still needs plenty of monetary accommodation. Judging from recent remarks by policymakers, those views don’t appear to have changed since the last meeting. Speaking at the European Parliament on Monday, ECB President, Mario Draghi, reiterated that rates are unlikely to rise before the autumn of 2019 even as he expressed confidence that “the projected path of inflation appears to be self-sustained”. The euro touched a 10-month low of $1.1506 in May as the cooling economy raised doubts as to whether the ECB would be able to end QE by the year-end. But as the Bank now presses on with policy normalization, investors aren’t impressed by the shallow rate path, as it leaves Eurozone rates well behind the US, where the Federal Reserve has been raising them since 2015. The monetary policy divergence is likely to continue to weigh on euro/dollar in the medium term unless there is a shift in the economic outlook that requires more aggressive policy tightening in the Eurozone or a pause in rate hikes by the Fed. In the near-term though, the single currency isn’t expected to find much support from the ECB’s minutes tomorrow. Euro/dollar could drift towards its 20-day moving average around $1.1650 if the minutes underscore the view that the ECB is in no hurry to lift rates. A break below this level would open the way towards the June low of $1.1507. However, should the meeting discussions hint at some hesitancy at the slow pace of normalization among some Governing Council members, euro/dollar could enjoy a bit of a kick upwards. Immediate resistance to an upside move lies at the upper Bollinger band around $1.1775. A break above this area could help the pair generate enough momentum to challenge the June top of $1.1851. Next articleLopez Obrador: A Helping hand from Mexico or a hand-out?